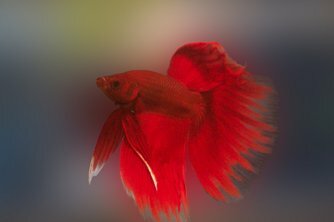 Siamese Fighting Fish or otherwise known as Betta Splendens are one most recognisable freshwater aquarium fish. They are perhaps the most colourful freshwater aquarium fish available. After years of keeping freshwater fish people often ask why I do not swap over to marine fish keeping, they remark that freshwater fish lack the colour and presence of marine fish. While for many tropical fish it is true that they cannot compete with marine in colour, but it is certainly not that case with this fish. They belong to the Anabantiod family of fish and like all anabantiods they have a labyrinth organ which enables them to breathe surface air. 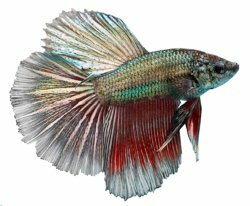 Siamese Fighting Fish ordinate from Thailand. They used to be breed for fighting. Males are very aggressive towards each other and should not be kept in the same tank. People would bet money on which fish they thought would win. 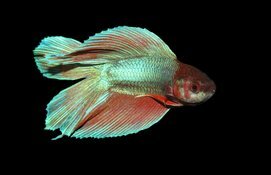 Siamese Fighting Fish were introduced to the west in the late 1800s where it was then selectively bred to increase it fins and the range of colours. 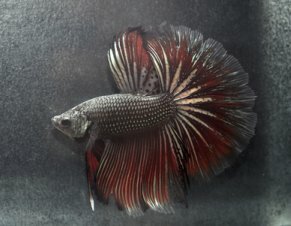 For many years really long fins were popular amongst fish keepers, but in recent years short finned versions have become popular. Some of fish have also been bred to have raggy looking tails. Although their name suggests an aggressive nasty fish, it is only true if you try and keep two males together. They are actually very timid fish which are much more likely to be bullied than do any bullying. They are best kept away from aggressive and fin nipping fish. A good example of a fish they should be kept away from is Tiger Barbs, the fighters long flowing tail is just too tempting for a Tiger Barb. They are slow swimmers so I would advise against fast moving fish as well. 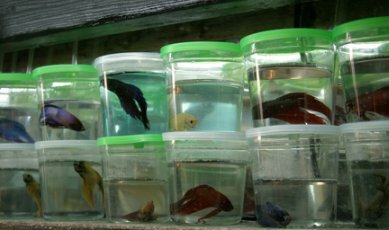 I have kept them with Guppies and other livebearer fish and have done well. As mentioned above these fish have developed and labyrinth organ. They developed it to survive in water which was dirty and lacked oxygen. Their environment had slow or no water movement. It would be wrong to deliberately house fish in unclean water, but you should try to mimic the little or no water movement part of their natural environment. They simply cannot cope with fast moving water. Many a fish keeper has found their fighting fish stuck to the aquarium filter. Do not use an overly powerful filter for their aquarium and limit the use of air stones and power heads. With a maximum size of 2.5 inches you do not need a massive aquarium. Some have keep bettas in goldfish bowls or jars. While it is true they do not need loads of space, if you want to see them at their best they need enough space to spread their fins and swim around. I kept mine in a 60 litre tank with other peaceful fish. Besides, could you image how bored and depressed, you would be if you spent your whole life in a jam jar. They also like floating plants, in my experience these are very easy to grow, they spread really fast so you only need to buy a small amount. Ideally they should be kept at a temperature of between 24 and 28C and a pH of around 6.5, although mine have lived happily at a slightly higher pH. Like many other Anabantoids the male Siamese Fighting Fish builds a bubble nest to breed. I would recommend moving these fish into a separate tank for breeding. The male would struggle to build a bubble nest in the community tank. It is very easy to tell the difference between males and females. Males are bright with long fins and females are much duller with shorter fins. Include floating plants in the breeding tank. The male will use them to anchor the bubble nest to. 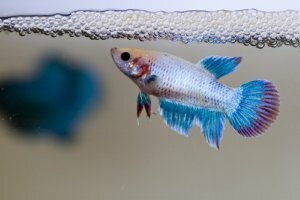 You should include a foam filter in the tank, it will create less movement and the fry will not sucked into it once they are born. You will need to make sure the female is in breeding condition before moving her to the breeding tank with the male; or the male may become aggressive towards her. When she is ready to breed her body will swell up a bit and you may also be able to see yellowish lines on her body. 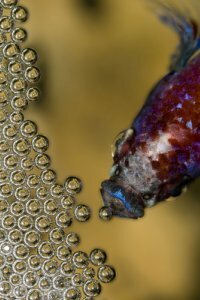 During the spawning process the female floats upside down while the males the eggs and carries them to the bubble nest. Around 500 eggs are produced during spawning. The spawning process lasts about two hours and you should remove the female once it is complete other the male may attack her. The male will guard the eggs until they hatch, this will take around 48 hours. Once hatched feed the fry powered flake food and brine shrimp. The males will need separating at around two months old or they will start to fight with each other.